16 output remote conrolled lighting board. 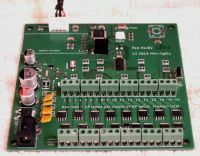 A remote controlled lighting board for your Doll's House or railway layout. Using the latest microprocessor design and surface mount components to provide a reliable and up to date product. Each output can be switch on and off, dimmed or flicker. All outputs can be switched on or off together. 12-14 volts DC power required, protected by auto-fuse and overvoltage warning. over/under voltage monitor & warning. complete with remote & sensor.